Five years after mass popular uprisings ousted longtime dictator Hosni Mubarek, Egyptians are again under siege. In an attempt to thwart demonstrations honoring the 2011 Arab Spring, the government of Abdel Fattah al-Sisi has deployed troops, raided homes and cultural centers, and reportedly disappeared hundreds of activists in the lead-up to the anniversary on Monday, intensifying a widespread crackdown on dissent. Meanwhile, activists estimate that between August and November more than 340 people « disappeared » into government custody. Sherif Mohie Eddin of the Egyptian Initiative for Personal Rights said the total number recently imprisoned is « not less than 1,000, » adding to the tens of thousands of journalists, religious and protest leaders, and other political detainees already held in Egyptian prisons. Despite the climate of fear, some protesters braved the streets on Monday to honor the legacy of January 25 and call attention to the ongoing violence and suppression. Egyptians demonstrated against the military-led government in Alexandria’s Al-Qaed Ibrahim Square, which was the site of 2011 protests, as well as in Nasr City and Shubra district in the capital, Cairo. Two Egyptians were shot dead by police in an alleged « exchange of gunfire » in Cairo’s October 6 district. Security forces also used gas bombs to disperse protesters in Cairo’s eastern al-Matareya district as well as in Kafr Sheikh. Residents reported that the build-up of security forces, along with recent crackdowns on activists and arbitrary raids on homes, reflected the government’s resolve to prevent marking the anniversary with popular demonstrations similar to those in 2011. Activists say that state repression today is even worse than under Mubarak. « This is without doubt the worst we’ve ever seen, » Hossam Bahgat, an investigative reporter who was recently detained by Egypt’s military intelligence agency, told theGuardian ahead of the anniversary. said Said Boumedouha, Amnesty International’s deputy Middle East and North Africa programme director. The five year anniversary comes amid intensifying war in the Middle East, which has enabled the United States and other western governments to continue to support Egypt as a key ally—with aid, arms, and military « cooperation »—despite the widespread and documented human rights abuses. For many who helped bring the revolution about, the anniversary marks a moment of reflection. Abdel Rahman Mansour, one of the activists who helped spur the 2011 uprising, argued Monday that Egyptians are engaging in a « silent protest » against the current regime. « I think the collective psyche of the Egyptian people is waiting for a moment, an opportunity, because you cannot achieve success twice with the same tools, and I think this is a good sign, » Mansour said. The low turnout in the last parliamentary elections is a reflection of people’s understanding of what type of regime they are living under. 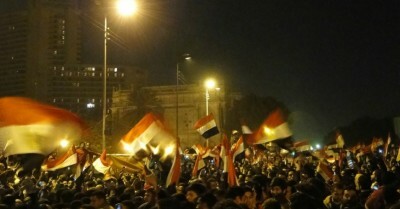 The low turnout was a silent protest on the part of the Egyptian people against the regime. When they see that the moment is ripe to defeat the police again, they will take to the streets to do so. January 25 came about because people believed in their ability to achieve victory. This moment is yet to come, and waiting for it is not a mistake. The onus is on the ordinary people who can make meaningful change. Tahrir Square protester Omar Robert Hamilton in a column Monday suggests that the memory of the revolution will hopefully sustain another someday. « The question is what might come next, » Hamilton continues. « The possibilities line up before us: decades of President Abdel Fatah al-Sisi overseeing a country slowly crumbling into the sea. A series of intra-military coups. More uprisings of the hungry and dispossessed. A slow democratisation process played out between competing elites. State collapse and an Islamic State insurgency. An acceleration in climate change, the flooding of the Nile Delta and widespread famine.